Today, I'd like to introduce you to the sweetest and most encouraging romance that I know. The author is L.M. 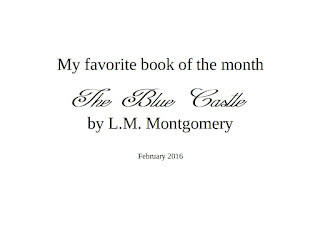 Montgomery, who's best known for her Anne of Green Gables series. 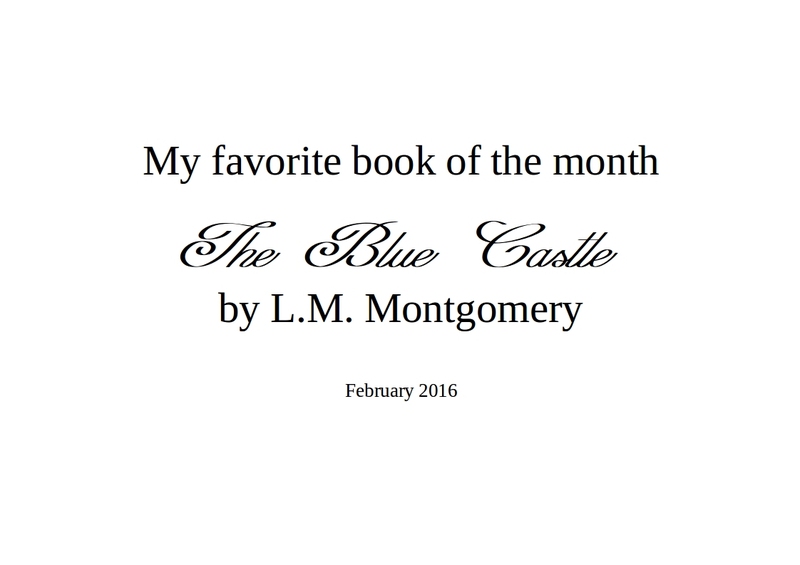 My favorite book of her, however, is called The Blue Castle. This books starts on a dismal note: "Valancy wakened early, in the lifeless, hopeless hour just preceding dawn. She had not slept very well. One does not sleep well, sometimes, when one is twenty-nine on the morrow, and unmarried, in a community and connection where the unmarried are simply those who have failed to get a man." When Valancy learns that she's seriously ill, she decides to make a drastic change in her life, a change that will bring her the happiness she craves, and this is told in such a charming way that I have read this book so many times that I can't count it anymore. It all starts with one quote: "Despair is a free man -- hope is a slave." When Valancy realizes that, she decides to do exactly as she likes for the short time that still remains for her. I rooted for her as she finally stood up for herself and answered back to all her dreadful relations who were so unkind and thoughtless. However, the thing I love most about Valancy is her craving for anything that's beautiful. She herself isn't, not in the eyes of society, but she wished she was - oh, how she wishes for beauty, not only for herself, but also in her surroundings. Ugliness around her makes her soul shrivel, and this is a feeling I understand so well that Valancy and I became one as she slowly unfolded her petals and became a strong and - indeed- beautiful woman. If you feel the need for a little pick-up, the need for courage to be just as you are, then I can only recommend this book to you. Let me know if you also have feel-good books, books that you turn to when you're in need of comfort and a hug. I've never heard of this book but it sounds sweet. Was there a HEA? I'm not familiar with this book but will try to check it out.